Online backup - Computer, Laptop or Server Crash, we have the best solution. COMPUTER, LAPTOP OR SERVER CRASH? Your personal and business data are important. Accounting, customer data, employee files, multimedia, program source code, administration, plans, photos, e-mails, … must not be lost. That’s why you need to protect your data through daily backups. Just imagine that, because of theft, fire, water damage, a virus, a power failure or technical defect, your current backup cannot be restored or contains corrupted data. What goes through your head at such a moment? In such an event, a good backup is simply essential. Online backup has some important advantages compared to a local backup. With Online backup, you have a backup no matter what happens. Your data are stored safely in two different data centres. Online backup offers you comfort and security. No need to invest in expensive software, updates, hardware, tape streamers, tapes and time to make and verify your backups. With a Online backup solution, the creation of your backup will be fully automated. Most important is you don’t have to worry about them anymore. Each day, without manual intervention, a backup is made, encrypted and sent to our different data centres where it is stored safe from fire and theft. Sub Domains, FTP Accounts, and Database. Moreover, we stores different versions of your backups so that you can retrieve the data from yesterday, last week, last month, etc. On the first run a full copy is made of all your data. For later backups, only new files and modifications are sent to your backup space. The restoration of files is relatively effortless. You can easily repair damage by a virus, a disk crash, fire, lightning strikes, flooding, accidentally erased data, system crash, theft, hackers, etc. by simply restoring a backup with the software or online, via our website, anywhere in the world, 24 hours a day, 7 days a week. Everything gone in one stroke! Impossible, you may think, but it can happen, if you haven’t secured a backup. Hardware may be expensive but your data are irreplaceable and therefore invaluable. Fire? Lost your laptop? Lost an external hard disk? Computer crash? With Online backup, your lost data is quickly and simply restored on your new computer, laptop or server. Insurance: your hardware maybe well insured but your online backup in our secured data centre is the best insurance. Simple installation: The application is fully configured in less than 10 minutes. The software is very easy to use and can be setup by you or your engineers. More comfort: Your backup is created automatically every day and immediately and safely stored in another location. You never need to take a backup home or change tapes. Carefree: After the setup, all files that need to be backed up are selected. After that, all selected files are daily or multiple times per day compared to the last stored version. All modified files are then compressed, encrypted and sent to our backup servers. Each time you get a notification by e-mail of the status of the last task. Secure: Security is highly valued. You need not worry about the security of your valuable files. Your files are stored safely and encrypted at two physically different locations. Both locations meet high standards so that you can be assured that your files are stored in real safety vaults. Unique TWINS system: For added security, your files are sent to two different data centres. This ensures 100% guarantee that your files are always safe. Multiple versions: Different versions of your files are stored so that you can retrieve the data from yesterday, last week, last month, etc. You can retrieve the files of any day on which a backup was made. Deleted and overwritten files are kept 90 days by default. You can change this yourself. Easy to restore: Sometimes it may be necessary to restore a file. Retrieving your files is very simple. With our software or on our website you can select your encrypted files and restore them, from any computer in the world, 24 hours a day, 7 days a week. Save time and money: Software, hardware, tapes, tape drives and the maintenance that goes with them are now a thing of the past. 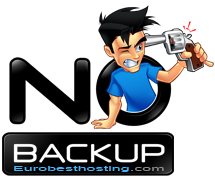 With the Online backup solution you are at ease. When you need more capacity, this is fixed with a click of the mouse. This way, your IT staff can focus on more interesting and strategic tasks.